For those of you who are use Viber as your text and messaging app, there is an update today that makes photo sharing a little bit easier. 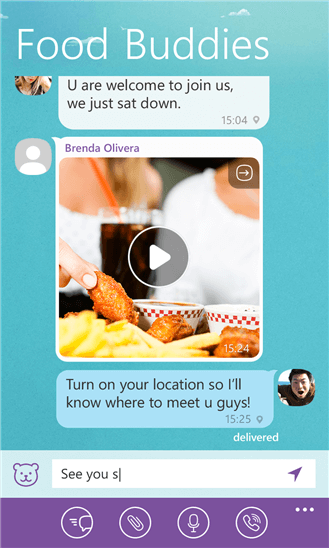 The updated version of Viber for Windows Phone brings two new features with the biggest one being the ability to easily view all photos in a chat by Swiping in a chat session. It is a quick way to go find that photo from a few days ago without having to do long scrolls back up the message feed. The update, version 4.5 for those keeping score at home, is available now in the Windows Phone store. If you aren’t familiar with Viber, it is a cross platform text, messaging, video sharing and photo sharing app. If you are thinking it sounds a lot like Skype, you would be correct. In addition to the new photo viewing in Viber for Windows Phone, there is one other new feature in this update. Now you can change the language of the app within the settings menu. That should make it easier for those who are multi-lingual to quickly see things in another language for the app without having to change any settings on your Windows Phone itself.